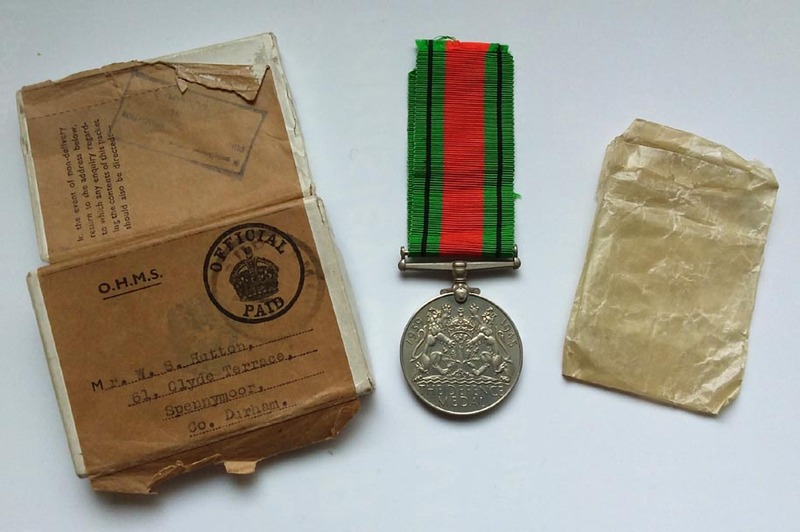 I have written this post to thank the eagle-eyed reader (AP) who spotted my grandfather Hutton's Defence Medal for sale on ebay earlier this week. I wrote about my grandfather back in January 2013 after finding some of his WW2 Home Guard paperwork and mementos in a box at my mum's house. Later I found more information about his service and was sent a photo of him in the Home Guard by my second cousin. 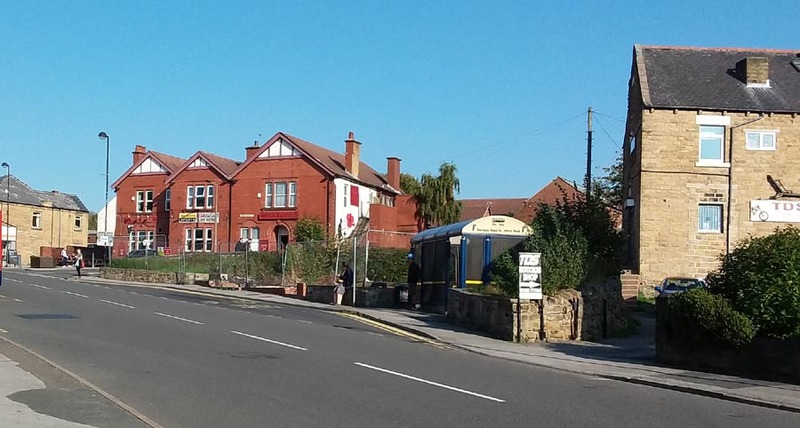 This formed a second blog post in June 2013. 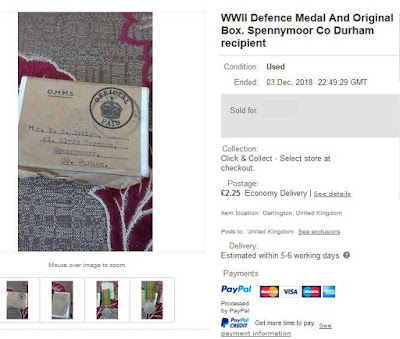 At the time I did not know where my grandad's Defence Medal was, although the paperwork showed that he had claimed it in June/July 1946, so it was fantastic that AP had spotted the ebay entry and linked it to me via my grandfather's name and address. I have blanked out the asking price in the snip above to avoid embarrassment as I really, really wanted to buy it! Thankfully the OH agreed and it came in the post this morning. I know that Second World War medals don't have the recipient's name engraved upon them like First World War medals and I already have my paternal grandfather's Defence Medal, so basically I now have two the same, but the box is special. This is what came, and I am very happy. To think that I am holding an item my grandfather handled over 70 years ago is quite a feeling. I have informed my mum about my purchase and look forward to showing her the medal and box when I see her next week. So thank you AP for the heads up and 756Keith somewhere in Darlington (the seller) for the swift response and dispatch of my grandfather's medal. 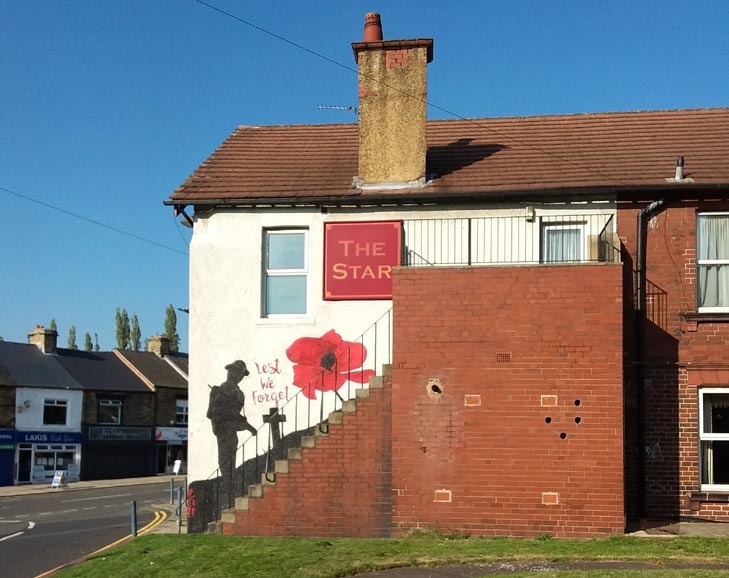 The demolition of the obsolete public toilets on Barnsley Road in Cudworth this last summer has revealed the Remembrance mural on the side of the Star Inn, St John's Road, to bus passengers and other passers by on the main road. Today's brilliant sunshine was a perfect opportunity to take some different views of the mural to add to my records. The mural was painted in 2015, commissioned by landlord Simon Davey, the artist was Craig Hoyle from Sheffield (information from the Barnsley Chronicle 13 Nov 2015). 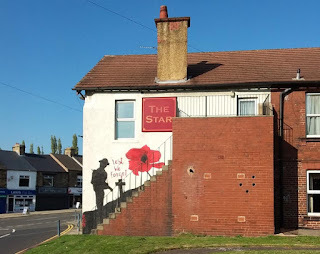 It is nice to see that three years later the paintwork still looks as good as new and has escaped the vandalism that has plagued the Memorial Garden in Cudworth Park which also features a mural. There is (was?) a similar painting on the side of the former Manx Arms (most recently Tykes Sports Bar) on Sheffield Road on the approach to Barnsley town centre. I must get the OH to take a photo of that if it is still there. What is the future of these memorials, because memorials they surely are? The definition of a war memorial can be found on this page on the UK War Memorials website. It includes any tangible object that commemorates war, conflict, victory or peace. 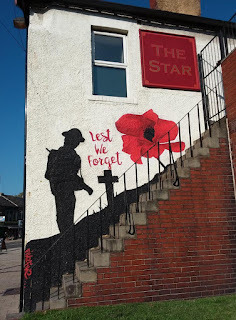 By the nature of these murals they will probably not last as well as a stone monument by the roadside or a plaque in a church, but we should value them whilst we have them and the meaning behind them.